The Thermo Jewett 4°C Lab Refrigerator provides tightly controlled, high performance storage for your critical samples. This Laboratory Refrigerator features microprocessor control, with audio and visual alarms to alert users to deviations in set temperatures, or power failures. 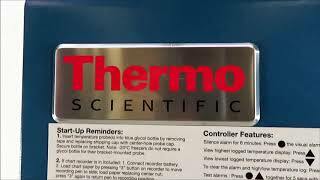 The interior of the Thermo Lab Refrigerator features a high impact powder coating for chemical resistance and easy cleaning, with a 1 in (2.5 cm) insulated access port, and bright, LED interior lighting for quick location of items. Temperature fluctuations are kept at a minimum thanks to the high density blown in insulation that reduces gaps by conforming to the cabinet shape, for a highly efficient environment, while positive forced air circulation keeps temperatures uniform throughout. The exterior of this Thermo Scientific Jewett High-Performance Refrigerator also features corrosion resistant powder coating, and a solid door, that stays open past 90ׄ° for easy access and is lockable for added security. This Thermo 4°C Lab High Performance Refrigerator CAT# JLR3004A has been fully inspected and comes with current temperature validations. All of our lab equipment comes backed with our standard warranty. Should you have any questions, please don't hesitate to contact us.